This entry was posted in How Does It Work? 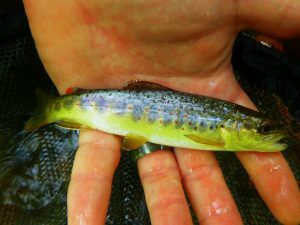 and tagged Dry Flies Dry/Dropper freshwater flies Learning to Fly Fish Monthly Fly Nymphing Small Streams spring trout fly fishing summertime trout fly fishing trout fly fishing Wild Trout on May 4, 2016 by Joe. 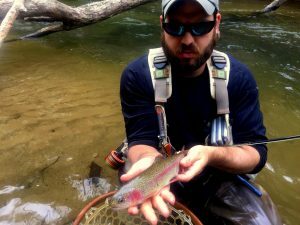 Joe’s Tip of the Week, Small Streams Part 1. Fishing for stocked trout can be fun, but if you are looking for more of a challenge and usually some better scenery, then try a small stream. My wife and I enjoy searching new waters and trying to find little gems in the mountains. Usually the scenery is grand and the fish are small, but all are wild. 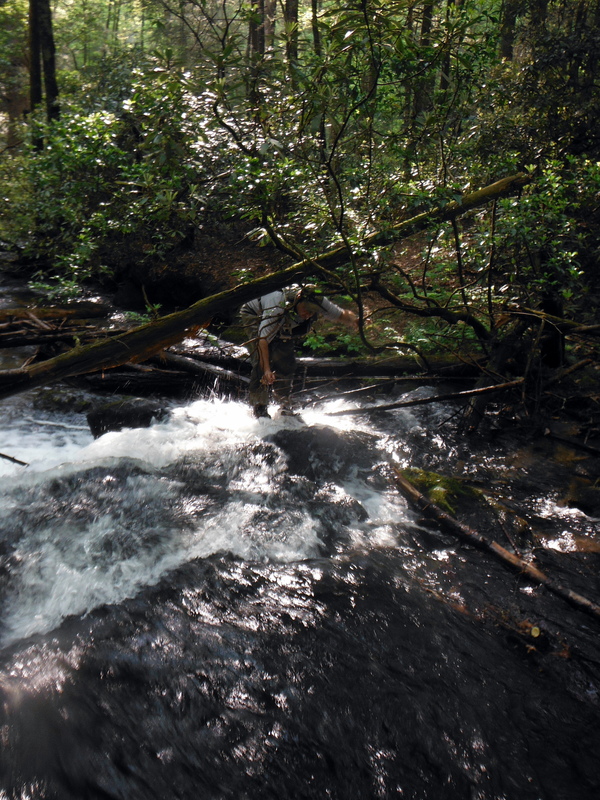 Small streams also hold an advantage that they usually clear up more quickly than larger rivers after a rain event. Big trout are fun, but in some of the small streams I fish, the trout are so opportunistic you can get them to hit a dry even if nothing is hatching. Here are a few tips to remember when trying for wild trout in small water to get you started. 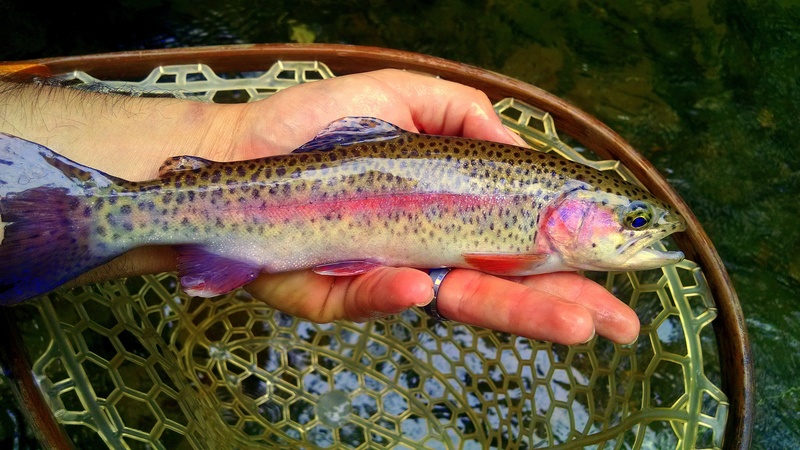 Typically, to get into wild trout, you need to get away from people. You may be traveling gravel roads. You will probably be making a significant hike beyond any kind of parking or access point. To get to these areas you need maps. Typically, electronic maps will not show you these small streams. USGS maps can be your best friend in finding these smaller streams. Watch out for private property and stay on State or Federal land. 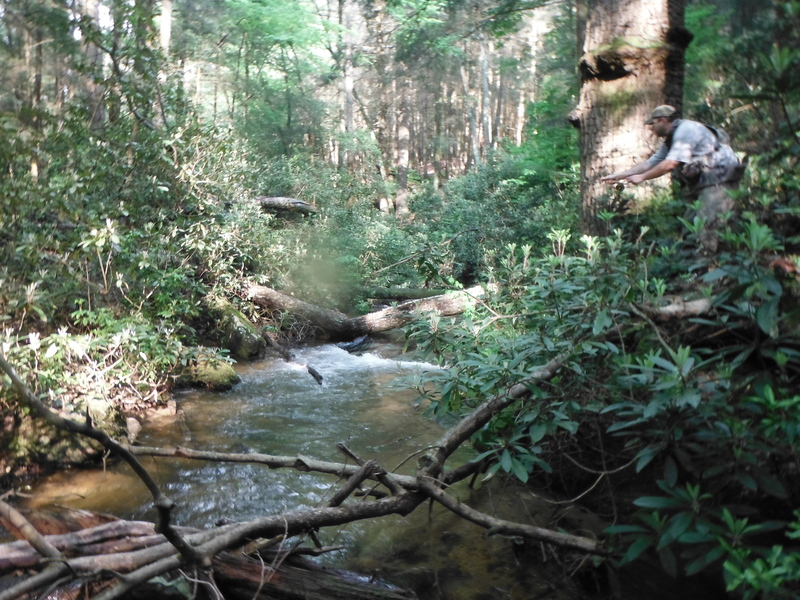 Start looking for feeder creeks or small streams that feed the local trout filled waters and work upstream. You’re searching for those areas upstream that are away from campsites, parking areas, and designated walking/hiking trails. Try walking up that brook or feeder creek looking for signs of people. Remember, if there are no signs of human life, try wetting a line from run to run and explore the area. 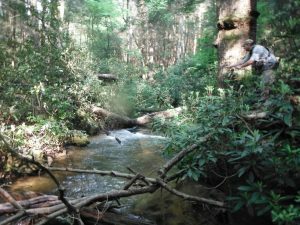 In these small creeks, you’re chasing fish that typically don’t see humans and will spook easily. Once you spook a wild trout, it is unlikely to eat. You don’t need to wear camo when chasing these wild fish, but dressing in muted, earth-tone clothing helps. When possible, work the creek from downstream to upstream to avoid spooking the fish. When moving from one run to another, walk outside of the creek if possible. Do not walk right up to the run that you want to fish. If you need to get closer to the run, get low. Crouch down or get on your knees. If there is a large rock, you can crouch behind it for cover. Remember, if you see the fish, it has probably seen you. One thing I love is dry fly fishing for wild trout in small streams since the small native fish tend to be more opportunistic. You need to try to match the size and color of what’s hatching. I typically carry Caddis patterns, Sulphurs, March Browns, and stimulators in a variety of sizes and colors. If you notice that you are getting a lot of strikes, but you’re not getting the hook-set, the fly might be too big to fit in the fish’s mouth. Try a smaller version of the fly. If the fish are not taking dries, I typically will tie on a dropper nymph. The nymph I tie on will match whatever is in that watershed I am fishing. I ALWAYS consult hatch charts. When doing a dry dropper in a creek or small watershed; I will adjust the length of my dropper depending on the water I am fishing. Generally, I allow 16-24 inches for every foot deep the run is. A lighter tippett will help the nymph sink faster as will a bead head. In addition to reviewing hatch charts, I typically carry a combination of Hares Ear, Pheasant Tails, Greenie Meanies, Frenchie’s, Soft Hackles and Midges. If a dropper is not working, then I will switch to a nymphing setup. I will only fish a small wool indicator when nymphing for wild trout. 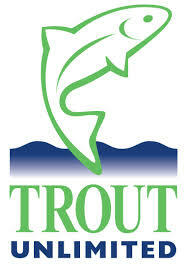 A white, tan or olive green will typically not spook the trout. Make sure the nymphs are getting close to the bottom, just like if you were fishing a river. Do not be scared to adjust your indicator depending on the depth of the run. Remember, if there is more than one person fishing, fish with different flies to see what’s working. If you are fishing dries, plan on covering a lot of water. If you work over a run without a bite, then move on to the next run. 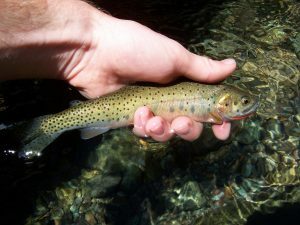 When I go and fish small streams I will not sit there switching out flies and get stuck on a single run for an hour or two; keep moving till you find a feeding trout, especially in new waters. If it is a familiar area and know that there is a solid fish population, I will spend more time and work the run over. When approaching a new run in I try to approach it strategically. I break the run down in a grid pattern and work it over from back to front and from the closest side of the run to me to the far. The idea is not to line the fish and spook them. I will downsize my gear when going on a small stream. Usually you are fishing in tight quarters, so a 9 foot rod becomes cumbersome. I typically use somewhere between a 6 foot and 7.5 foot fly rod in a 3 weight or smaller. I will fish a 6 foot leader and use a fluorocarbon leader if nymphing or monofilament when throwing dries. I use a 6x leader/tippet or smaller. Depending on the stream I even have 8x tippet. Smaller tippet is necessary since these are small wild trout that spook easily. Remember, take care of what we have today so other generations can enjoy it later. Release the wild fish and, if you must, keep the stockers.